Russian President Vladimir Putin denounced the strike on Syria launched by the United States and its allies as an "act of aggression" that will exacerbate humanitarian catastrophe in Syria. Putin slammed the attack as a "destructive influence on the entire system of international relations." "Good souls will not be humiliated," Syrian President Bashar Assad tweeted. 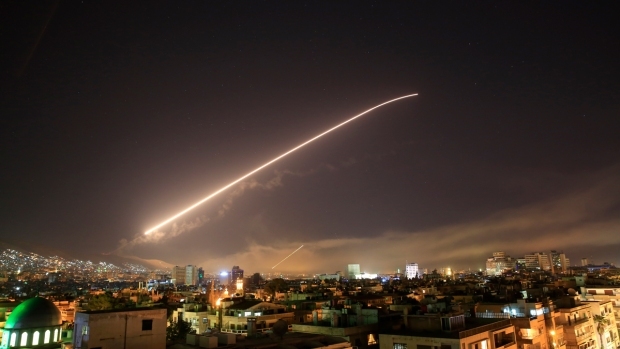 Moscow called an emergency meeting of the United Nations' Security Council over the strike launched by the U.S., Britain and France, but the council rejected Russia's resolution to condemn the strikes. Only three countries — Russia, China and Bolivia — voted in favor, eight countries voted against and three abstained. And the U.S. made clear that Russia was working to bury the truth, with the Pentagon saying a Russian "disinformation campaign" had already begun over the strikes. Chief Pentagon spokeswoman Dana White said Saturday that "there has been a 2,000 percent increase in Russian trolls in the past 24 hours." The Russian Embassy in the U.S. piled on to the condemnation, saying President Donald Trump's criticism of Putin is "unacceptable and inadmissible." The embassy said in a statement the president's airstrikes represent Russia's warnings "left unheard." "Again we are being threatened," ambassador Anatoly Antonov said in a statement. "We warned that such actions will not be left without consequences. All responsibility for them rests with Washington, London and Paris." Russia's Foreign Ministry spokesperson Maria Zakharova said the attacks hit a long-troubled country "that for many years has been trying to survive terrorist aggression." Zakharova also took Western media reports to task, saying, "The White House stated that its assuredness of the chemical attack from Damascus was based on 'mass media, reports of symptoms, video, photos as well as credible information.' After this statement, the American and other Western mass media should understand their responsibility in what is happening." Sakharova compared the situation to the start of the Iraq War in 2003, which she said was based on claims Iraq was developing weapons of mass destruction. A highly placed Russian politician even likened Trump to Adolf Hitler. Alexander Sherin, deputy head of the State Duma's defense committee, said Trump "can be called Adolf Hitler No. 2 of our time — because, you see, he even chose the time that Hitler attacked the Soviet Union." 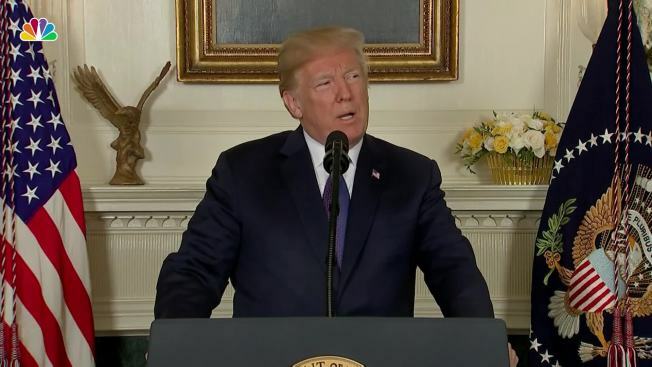 Sherin was referring to the time of day in Syria Trump chose to launch the strikes, according to state news agency RIA-Novosti. The Nazi forces' opening attack against the USSR in 1941 was launched around 4 a.m.
Trump had chastised Syria's two main allies, Russia and Iran, for their roles in supporting "murderous dictators," and noted that the Putin had guaranteed a 2013 international agreement for Syrian President Bashar al-Assad to get rid of all of his chemical weapons. And on Friday, Trump called on Moscow to change course and join the West in seeking a more responsible regime in Damascus. Defense Secretary James Mattis and Gen. Jospeh Dunford held a press briefing after President Donald Trump announced military airstrikes on Syria. A top Russian lawmaker said Moscow's response to Western airstrikes must be carefully considered. "Emotion is not what's needed now, but professional assessment by military specialists working on the scene," Konstantin Kosachev, head of the foreign affairs committee of the upper house of parliament, said Saturday, according to state news agency RIA-Novosti. However, Kosachev said, the attack's meaning was clear: "It's a scandalous violation of international law and this is an attack on a sovereign state without an underlying basis." Kosachev reiterated the view of other lawmakers that the attack's intent was to interfere with international investigators who want to probe whether a chemical weapons attack took place in the town of Douma last week. Iran also joined Russia in denouncing Trump's decision. Iran's state-run IRNA news agency said Supreme Leader Ayatollah Ali Khamenei called the airstrikes a "military crime," speaking at a meeting with Iranian officials and ambassadors from some Islamic countries. The report quoted Khamenei as calling the leaders of the United States, Britain and France "criminals." Iran is a key ally of Assad and has sent troops to bolster his forces. Iran insists its soldiers are only in Syria in an advisory role, but hundreds have been killed since the civil war began in 2011.